Summary: A rather slow week that centered mostly on the new hatches over our forward cabins. 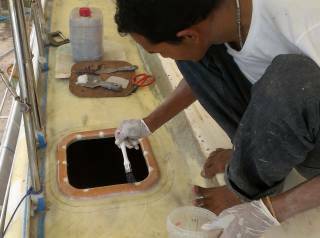 The hatch locations were laid out and the deck cut away, then the foam hatch rims were constructed and epoxied down. The foam where the bolts will go, and the foam below the rims in the deck, was dug out and filled with reinforced epoxy mud, but the rims themselves still need to be glassed in. 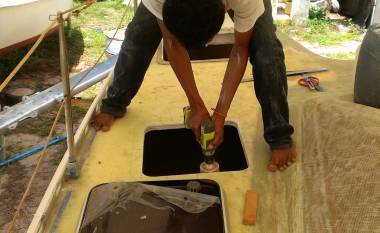 Sue continued refurbishing the hatches but having to get a root canal on Tuesday slowed her down. In the evenings Sue worked hard to document all the finances of the refit, what quotes we've received from Golf, what they cover, what payments we've made and what they were supposed to cover, etc. 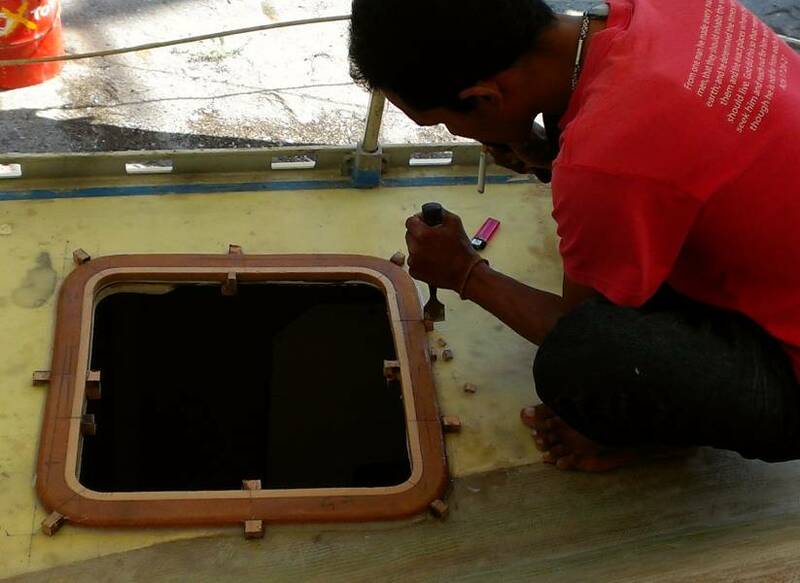 Jon helped Baw and Houa glass in the remaining hatch rims on port side and then sanded the glass down to allow the hatches to fit nicely. Otherwise Jon spent most of his time polishing the mast. 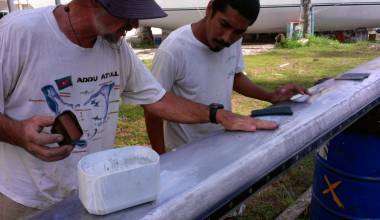 We worked out that a new scrubby pad will clean the mottling off the mast, leaving it ready for the Nyalic. We spent quite a lot of time in meetings, first with Golf and Houa to determine how much more time it will take to finish the work on Ocelot (56 man weeks!) and then going over Sue's financial report with Golf, and finally with the yard management to clear up some issues. On Friday evening Amanda returned from a month of gallivanting around Thailand with Liz and Monica so we took Saturday off to drive around to the new Krabi marina. A rather slow, and hopefully not inauspicious beginning to the week. Houa and Baw spent the morning inside Ocelot vacuuming and then taping up plastic to protect the teak and teak bulkheads from dripping epoxy. It was a hot and fiberglassy job, and Baw had himself powdered up in talcum powder to ward off the itchies that come from fiberglass dust. Golf arrived with a new (small) batch of epoxy just before lunch. Houa and Baw spent the afternoon glassing in 3 of the deck hatch rims on port side, starting at the aft one (over Amanda's cabin) and moving forward. Without Jon's help it must have taken longer than starboard, because they only got 3 done by the end of the day, but with Jon helping on starboard they only took about an hour each. Why no Jon? Because he came in early, and left early with a case of Thai Tummy. He spent the day resting at the apartment, so with luck he'll feel better tomorrow. Sue held down the fort, checking on the epoxy project on deck, but mainly working on her continuing refurbishment of the hatches. Lots of silicon to chisel out, and even some misplaced epoxy resin that spattered onto the aluminum hatch trim. Grrrrr. Bit by bit, though, they are looking better. A sunny bright day, marred only by Sue's having to visit the endodontist for a root canal treatment, so that took her out of the yard for the afternoon. The big news today is that Baw started on the new hatches for our forward cabins this afternoon. Our aft cabins are better ventilated and often move less when we're on passage, but the beds in the forward cabins are slightly longer so that's where we sleep, leaving the starboard aft cabin as a guest cabin for visitors. To improve ventilation in the forward cabins we bought bigger hatches (for $500 each) that we've been carrying for the last 11 years! Now we're finally getting to put them in. So this afternoon Baw laid out where the hatches are to go, squared everything with the bulkheads inside, and cut out both hatch openings in the deck. We're keeping the aft outside corner in the same place as the original hatch, which should save us some trouble later. Even so, the headliners and the headliner supports in both cabins will have to be modified. It was interesting (to Jon) to see the the cross section of the deck. The lowest layer of glass was much thinner but we added some when we re‑foamed the deck. The glass above the foam seems all well bonded in. The white filler above the foam seems thicker than we thought it would be, but the glass over it makes it structural, part of the sandwich construction. Jon was a bit concerned that taking such a large chunk out of the deck might weaken it, especially there, in the middle of a large, unsupported space. So he stood on one heel and thumped down on the deck with the other, our "Thump Test". It moves a bit, but not as much as he'd feared, and it's certainly well within acceptable limits. The whole deck still feels solid and strong, even around that hatch. Stepping back to the morning, Jon (feeling better now!) was up on deck with Baw and Houa. 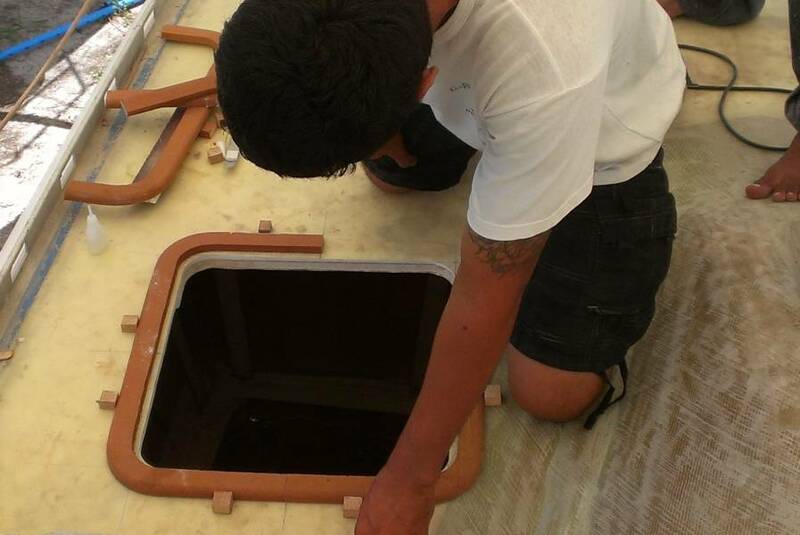 They got the last 2 small deck hatch rims on port glassed in. It really speeds things up to have 3 sets of hands! Sue made good progress before lunch with the recalcitrant silicon in the grooves of the old cabin hatches. What a job it is to clean them up! Jon was working on the mast in the afternoon when the power went out. Luckily, our neighbor fired up his little 2KW generator and let us plug in as well, so we could continue working. It was nice to see how much better the tools work when they're getting their full voltage (the voltage at the yard is seldom better then 170v). Jon's grinder was positively singing! A fantabulously beautiful day, with not a cloud in the sky when we woke up, and a lovely tropical breeze for us at our private lunchtime beach. We had an east to southeast breeze blowing in our faces, indicating a possible change from the (wet) SW to the (dryer) NE monsoon. Today work centered on the forward hatches. Baw squared up the holes with the interior bulkheads (Jon checked) and then started building the foam rims that the hatches will mount on. 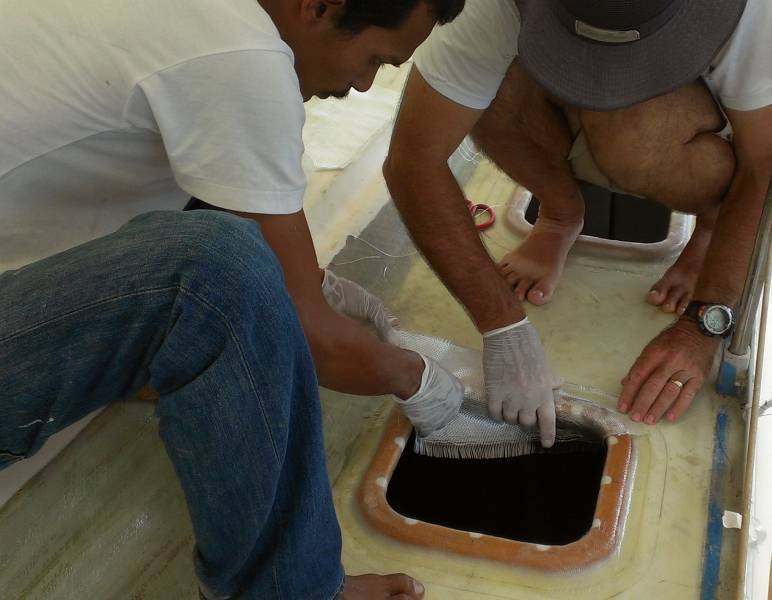 We have no more 15mm (.59") foam but it turns out that some time ago the guys built 3 rims for the hatches above the main cabin, not realizing that those hatches already have rims, molded into the cabin‑top. Those hatch rims are a bit smaller than what we need, but by cutting up the 3 rims Baw could easily make the 2 rims for our new hatches. 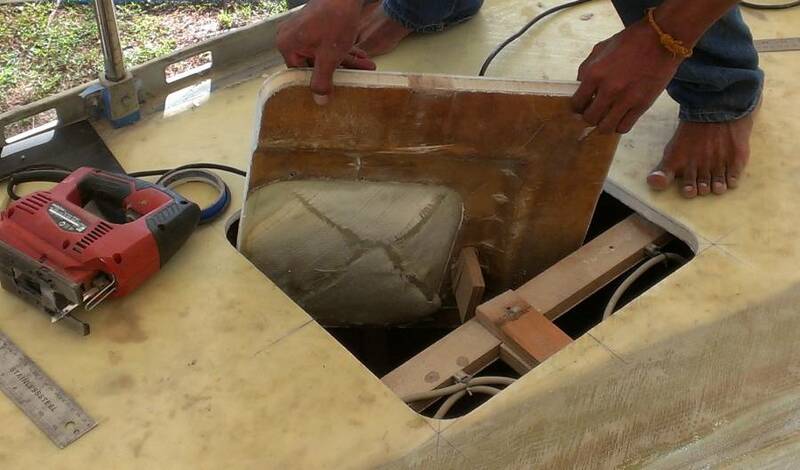 Unfortunately, those rims are also not quite wide enough for the new hatches, but by placing the rims where the outsides need to be, the insides can be filled later with small strips of foam and/or epoxy mud. The insides of the rims aren't seen unless the hatches are removed, and they'll be covered in fiberglass anyway. They don't take any structural loads at all so they can be assembled piecemeal. By the end of the day Bow had positioned and assembled the rims for both forward hatches and epoxied them down to the deck! One issue that came up is that the bolts for the forward hatches are now over the foam that we put into the deck to replace the ruined balsa. Jon had thought that we'd have to cut back the glass underneath the hatches, taper the foam, and reglass the foam, a long and messy job he was not looking forward to. 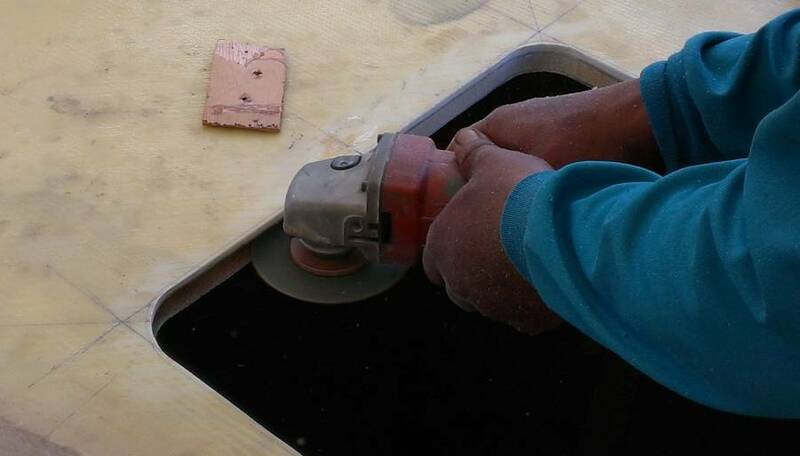 Golf came up with a much neater solution - simply grind away the foam and fill the space with epoxy mud! Houa quickly made up a jig for his grinder that let him accurately grind out 1" (25mm) of foam from between the layers of fiberglass. The grinder went through the foam like a hot knife through butter. It took Houa about as much time to de‑core the edges of where the hatches will sit as it's taking me to write about it! The foam rims themselves will also have to be de‑cored and the holes filled with mud, but Baw has had to do that for all the other hatches already so he's used to it. Jon's morning job was to sand back the glass on some of the rims so the hatches will fit. Although the rims were made purposely big so the hatches would fit even after they were glassed, the way we laid the glass made it bunch up in the corners, requiring that the glass in the corners be ground back a bit before the hatches would fit. 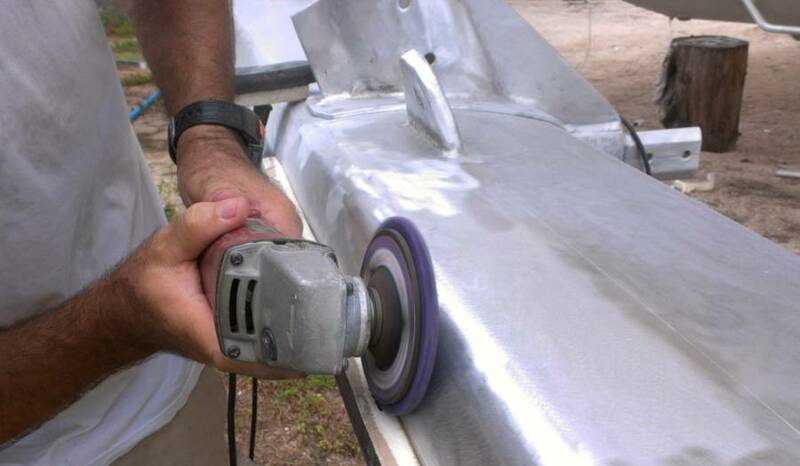 Jon took the opportunity to also sand the fiberglass with a (relatively gentle) orbital sander, as the guys prefer to use the much faster but also more brutal grinders, which are powerful enough to go through the light UD glass covering the rims in a heartbeat. Bit of a short day today, as we had another long meeting with Golf in the afternoon to discuss finances (for which Sue spent hours preparing! ), but we did make some headway on the boat. 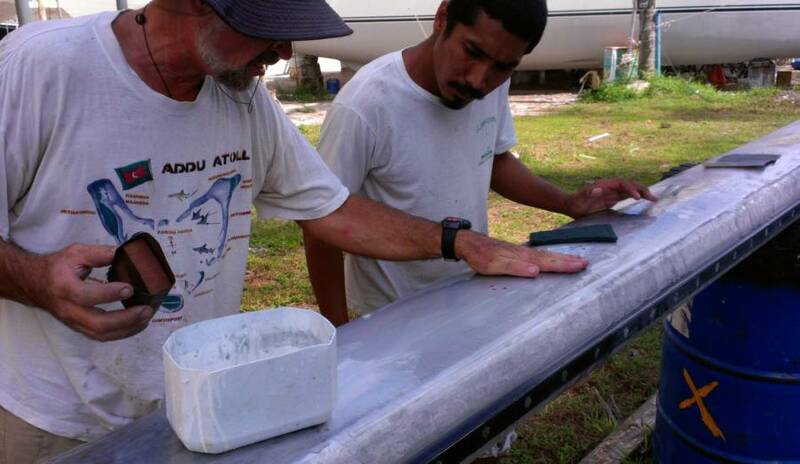 When we got to the boatyard, Baw was just unveiling the forward hatch rims that he'd epoxied down last night. 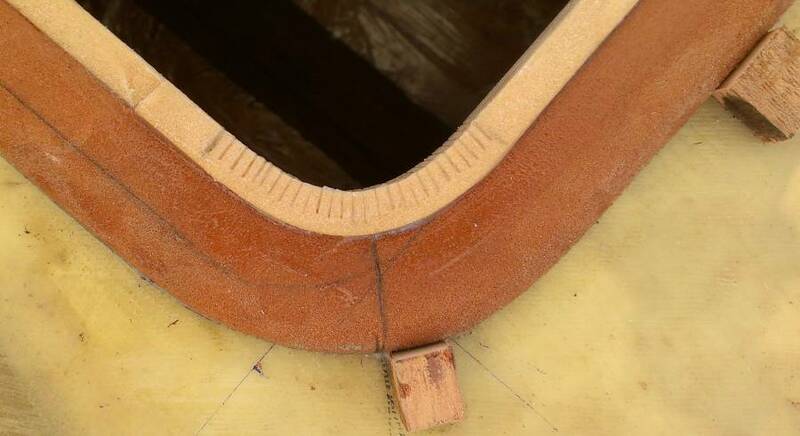 He'd even added a foam strip inside the outer rim, to make the rim as wide as it needs to be, slicing most of the way through the foam so it would bend around the corner. The rest of the day was cleaning up the epoxy work, sanding the foam down to shape, and digging the foam out of the deck under the rim on the portside hatch (Houa had done starboard last night). 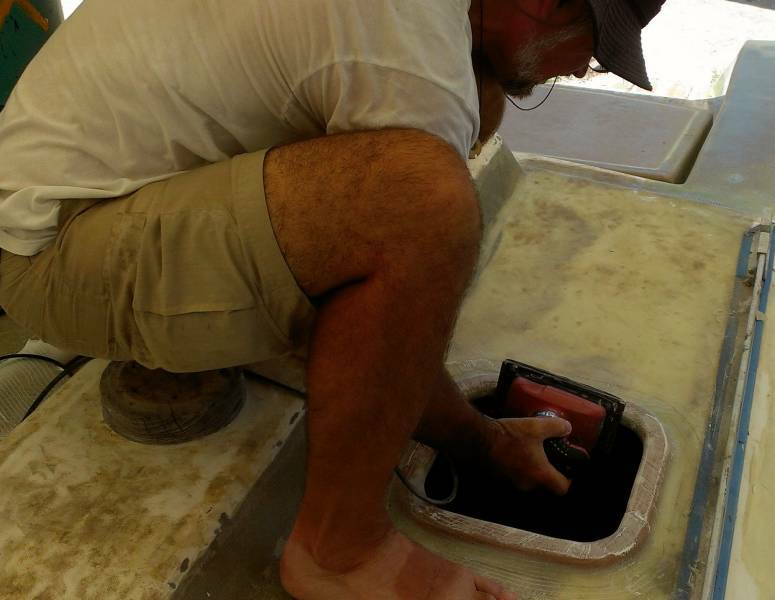 Then Baw marked where the hatch bolts go and drilled out circular holes in those places and filled them with "hairy" epoxy mud. Before they could glass in the rims they had to fill the voids in the deck with more epoxy mud, where they'd dug the foam out earlier. This area is big enough that they had to do it slowly, so the epoxy doesn't go into thermal runaway. Jon spent a bit of time sanding more of the fiberglass over the hatch rims. It's a nasty job (the fiberglass sandings can itch terribly if they get on you) but we want it done gently with the orbital sander instead of a grinder. Apparently the Thais call the orbital sander a "Dancing" sander! Jon also spent some more time on the mast. The polishing disks he's been using take out the grinder marks very nicely (if a bit slowly). They leave the mast very smooth, but a bit mottled, and we're not sure if that's dirt or something else. We've asked Golf to bring us "the next step" in polishing but he doesn't really know either, so we struck out on our own. Jon attacked an area that had been polished with a green Scotch‑Bright "scrubby" pad and water to clean the mast, followed by light sanding with some extremely fine 1,200 grit paper on a sponge block. The results seem very hopeful. The scrubby cuts through the dirt reasonably well, leaving the mast almost uniform in appearance. 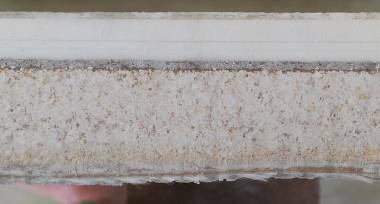 We're not sure if wet‑sanding with the 1,200 grit paper is adding value or not. But we think we've found the final stage that we were looking for. Now we need to try some of this fancy Nyalic coating on an area that we've finished polishing. Some folks have written saying that 56 more weeks of work is ridiculous, and it is. But these are man‑weeks. Many jobs can go on in parallel, so if we get 2 workers the time gets cut in half to 28 weeks, and with 4 workers it gets cut in half again to 14 weeks, etc. With too many workers it becomes a full time job to manage all of them and keep them working efficiently, but that's what we hired Golf for. An interesting day, but more for some political infighting at the boatyard than actual boat work on Ocelot. Our fun news is that Amanda returns this evening after a month of gallivanting around Thailand with her university buddies Liz and Monica. Yay! We've missed her delightful energy at the boatyard. More Ocelot related, our neighbors and us had an interesting meeting with the boatyard manager this morning. We'd hoped that the meeting would include Manop and Manoon, the owners of the boatyard, but it was just Num, who has recently become the yard manager. Num has decided that all future work orders must go through him, which gives him lots of power to distribute and control jobs. The workers at the boatyard are all independents like Golf, not employees. So if Num doesn't like one of them, he can just funnel all the work to other workers. This has already happened with 2 boats that wanted Golf to do work for them! They didn't like the situation so they just left to have their work done elsewhere. So Golf (and the boatyard) have been losing business because of the new policy. Num has a business degree from California, and his main asset (besides the degree) is that his English is even better than Golf's, which all of the other contractors need as they don't really speak enough English to interact easily with us foreigners. 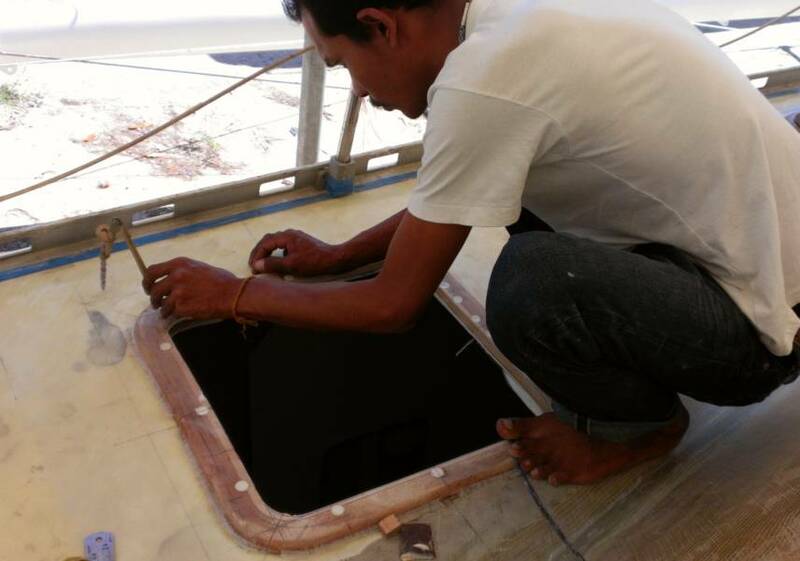 The contractors are supposed to go out to the boats, assess the cost of the job, and give that quote to Num who then adds on his and the boatyard's cut (about 10%). Num then gives the final quote to the boat owner. If the owner has any questions (and we always do) then Num has to pass those back to the contractors, as Num knows very little about boat work himself. Part of the strangeness of this arrangement is that the boatyard wants to take a cut of the materials as well as the labor. Boatyards taking a cut from workers coming to work at the yard has a long history worldwide, but taking a cut of the materials as well strikes us as pretty greedy - we don't know of any other boatyard that does that. And it's not very enforceable either. Today we gave Houa some money to run out to Phuket Fiberglass to buy some more epoxy. In future, would the yard expect a cut of that? Golf has known that he owes a percentage of our contracts to the boatyard, but because of cost overruns he doesn't have the money right now. A few weeks ago the boatyard came to us and said that if we don't pay Golf's outstanding percentage (about $3,000 for us) then they wouldn't put us back in the water! The meeting today was supposed to clear that issue up, and it did. The yard recognizes that we boats shouldn't be held responsible for our contractors' debts, which is a relief for us (and our neighbors). But Jon also pointed out that by denying Golf work and scaring away his customers, Num is making it difficult for Golf to pay his debt to the boatyard. Jon phrased it more gently and surrounded it with platitudes so it sounded nicer, but that's the gist. Num squirmed a bit but said that Golf has more painting work coming soon, which is good news for all of us. Num says that he recognizes that Golf is the best painter (and probably the best general contractor) at Coconuts, but he's a poor businessman, which we all know. Hopefully they'll be able to work together, Golf learning business from Num and Num learning boats from Golf, but they've both got a long way to go. At least we got it all out in the open. On Ocelot herself, little happened in the morning because they were out of epoxy. When Houa returned from his epoxy excursion, he and Baw filled the area underneath the forward cabin hatch rims (where they'd removed the foam) with epoxy mud reinforced with bits of fiberglass. 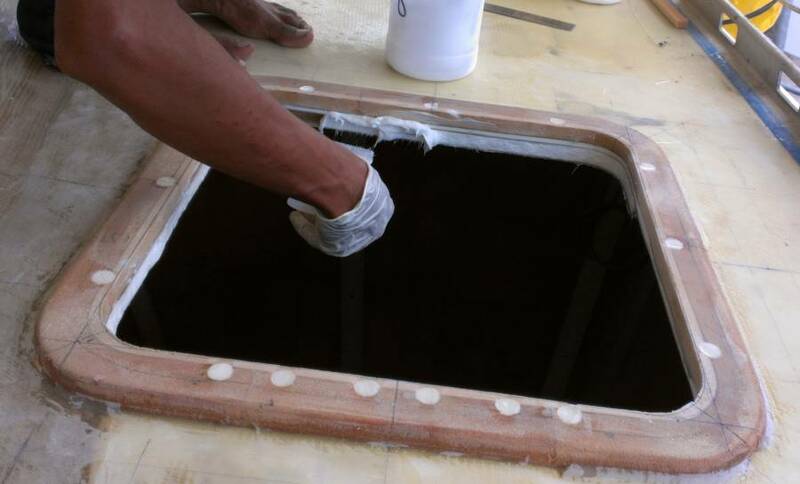 Sue used some of their epoxy to put more fiberglass in the hole for the starboard prod pad‑eye backing hole, and then she returned to cleaning up the hatches. Today was a vacation day for us. We'd rented a car so we could pick Amanda up from the airport last night, a round trip of 50 miles or 80km. Since we already had the car we decided to go play today, driving around the northern end of Phang Nga Bay to the town of Krabi, a 1‑way distance of about 130 miles (220km). Luckily, most of the way was on a divided highway with 2 lanes each direction, but traffic was heavy enough that it still took us 3 hours each way. A new boatyard and marina has opened up outside Krabi and we wanted to see what it was like. It's got lots of space and is currently offering special deals to attract boats. There's a long float for big boats to tie to, but the longest fingers are only about 35' (11m). Nevertheless, a pair of 50' cats were tied to the fingers. The yard is nicely paved and has a modern travel‑lift, a couple of small chandleries, a fancy and airy office building, a coffee shop, and a tiny grocery store. 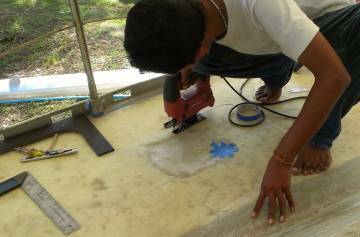 There are some basic workers for sanding and such but apparently none are very qualified (qualified workers can, and have, come from Phuket). The main problem is that it's a bit out in the sticks. It's 4 miles (6km) to the closest town and you can rent a scooter at the yard, but even Krabi (much further away) doesn't have much besides basic supplies. The chandleries can order stuff in but it takes time and bringing parts into Thailand is not cheap. The yard knows all this of course, and they're working to make things better, but for the time being it's probably best if you arrive with the supplies (and skills and inclination) that you need.